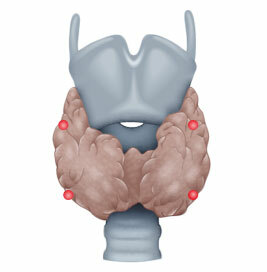 As a rule, four parathyroid glands are located on the top and bottom of the posterior aspect of the thyroid gland. They regulate calcium homeostasis in the body. Parathormone, which is synthesized by the parathyroids, mobilizes calcium from the bones and promotes enteral uptake in the gastrointestinal tract. Renal calcium loss is simultaneously lowered by diminished excretion. Calcium in the body is strictly regulated since an over or under supply causes severe symptoms. Hypocalcemia, which occurs e.g. after thyroid or parathyroid surgery, causes muscle cramps and formication. Elevated calcium can lead to kidney stones or cardiac problems. Cases with full-blown manifestation of the classic triad „stone, bone, stomach pain“ (signifying kidney stone, osteitis fibrosa cystica, and dyspepsia) are rare. Nevertheless, this same triad must be checked in a patient’s medical history. The relevant stone diseases are kidney and ureteral stones secondary to elevated calcium levels in blood and urine. Bone pains can be caused by continuous mobilization of calcium, and stomach pains can be signs of an erosive gastritis or stomach ulcer due to elevated gastrin secretion stimulated by calcium. Elevated Ca++-levels over course of sHPT due to secondary autonomy of parathyroid glands or an imbalance between PTH production and need. Etiologically, a distinction is made between three types of hyperparathyroidism, primary (pHPT), secondary (sHPT), and tertiary (tHPT). In pHPT, the increase in parathormone levels is caused by an adenoma in one or, rarely, several parathyroid glands. In sHPT, a kidney ailment is usually responsible for the clinical picture, e.g. chronic renal insufficiency or renal failure requiring dialysis. So much calcium is lost renally that the parathyroid glands are continuously activated and ultimately undergo hyperplasia, secreting collectively excessive parathormone that a single gland could not do. In tHPT, prolonged sHPT leads to formation of an adenoma in one or several parathyroid glands. High blood calcium levels in routine diagnosis always require further clarification, since calcium levels are tightly regulated and even a small deviation from normal values is suggestive of disease. Phosphate blood levels should also be determined, these too show characteristic changes in HPT. Since HPT always occurs in multiple endocrine neoplasia (MEN), calcitonin should also be determined so as not to overlook a C-cell carcinoma. and can sometimes also provide clues to the location of an adenoma. 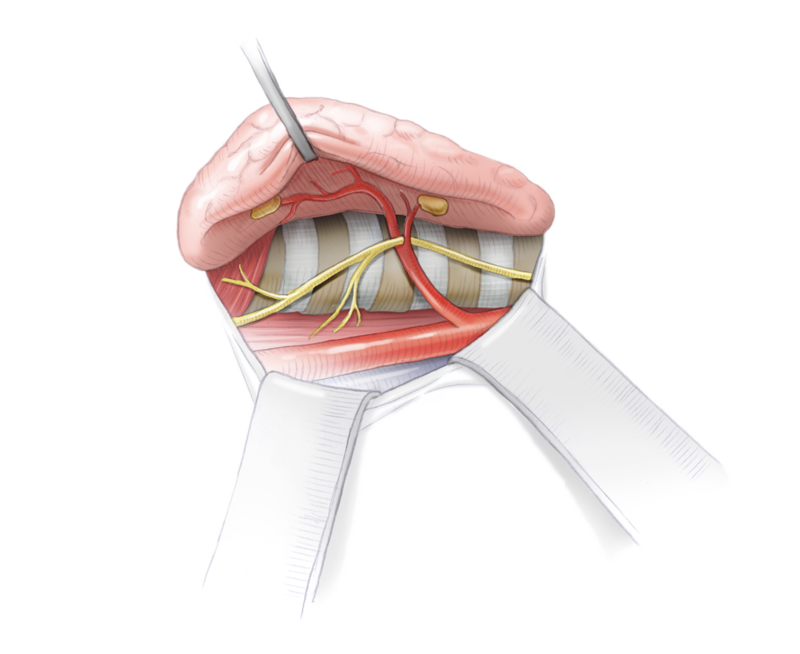 Bilateral blood sampling from the internal jugular veins and subsequent hormone determination can further narrow the location. The most reliable method, however, is intraoperative localization, which naturally requires complete exposure of all parathyroids. If two different preoperative examination methods pinpoint the same location, a minimally invasive 1-cm incision can be made over this site for the operation. Parathyroid hormone (PTH) can be measured intraoperatively using so-called Quick-PTH assays, which exploit the very short half-life of PTH. At start of surgery, a baseline PTH value is obtained, then about 5 minutes after resection of a suspicious parathyroid nodule the PTH level is measured again. If PTH levels fall to 10% of the baseline value, it can be assumed that the adenoma has been successfully removed and the operation can be ended. Otherwise, the other epithelial nodules must be exposed and examined. 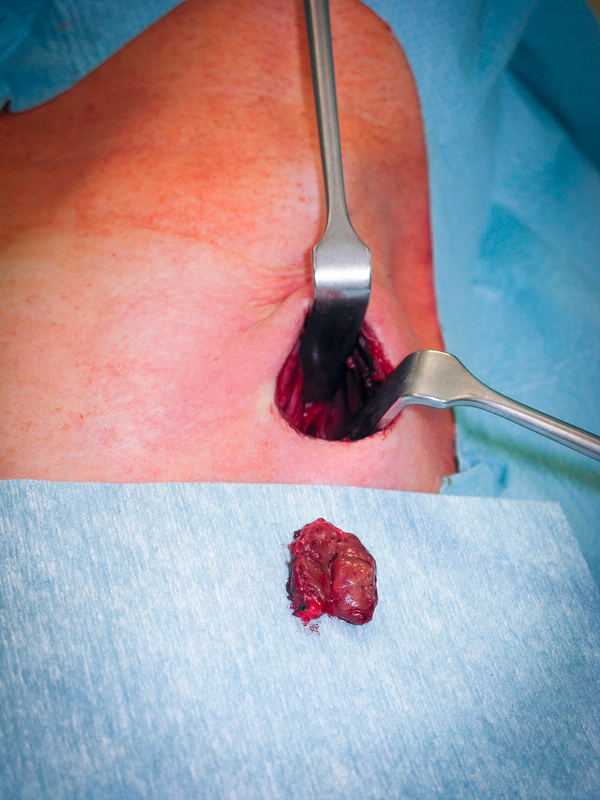 In pHPT the goal of surgery is to find and remove the adenoma. The remaining parathyroid nodules do not need to be exposed if the localization diagnosis was unequivocal and intraoperative Quick-PTH confirms successful resection. If preoperative localization is not possible, all four parathyroid glands must be exposed and evaluated intraoperatively based on their size or by frozen section biopsy. This was the standard procedure before introduction of scintigraphy. In sHPT, the parathyroid glands are collectively responsible for the high parathormone levels. Removing just a single nodule is therefore not an option. 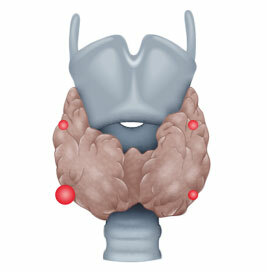 But to remove all epithelial nodules is also not advisable, since it would lead to an absolute hypoparathyroidism. Therefore 3½ nodules should be removed or all 4 removed and a portion of one reimplanted. This involves autotransplantation in a muscle, either in the underarm or the sternocleidomastoid muscle, where oxygen can be diffused into the tissue. The surface area of the nodule is increased by cutting it into small pieces. The resected nodules are cryopreserved for later retransplantation in case parathormone levels drop, whether due to failure of the initially transplanted tissue or elimination of the HPT’s underlying cause, e.g. by renal transplantation. The procedure in tHPT is the same as in sHPT, taking care not to reimplant the adenomatous epithelial nodule.